Salitas FC of Burkina Faso won 2-0 away to Al Masry of Egypt on Saturday in the biggest shock so far of the African Confederation Cup round-of-32 first leg matches. The Ouagadougou club are debuting in the second-tier African club competition just one season after being promoted to top-flight football in the west African country. Salitas even struggled to make the draw for this round, needing the away-goal rule to squeeze past fellow African newcomers Wakriya of Guinea. But they put nervous preliminary-round performances behind them in Port Said as they rattled Masry, who reached the 2018 Confederation Cup semi-finals. Egyptian clubs rarely lose at home in African competitions – but Masry were left stunned on 32 minutes when Cedric Badolo ran unchallenged from the centre circle to score with a shot that was deflected into the net by the Masry goalkeeper. A spectacular overhead kick from Ismael Karambiri on 72 minutes doubled the lead and left the Egyptians facing a huge recovery mission in Ouagadougou next Saturday. While Masry are in serious trouble, fellow Egyptians Zamalek went on a goal romp in Cairo to build a 7-0 first-leg lead over ASCOT of Chad. Chadian resistance lasted just 11 minutes before Mahmoud Kahraba netted and the other scorers included Tunisian Ferjani Sassi and Congolese Kabongo Kasongo, who bagged a brace. 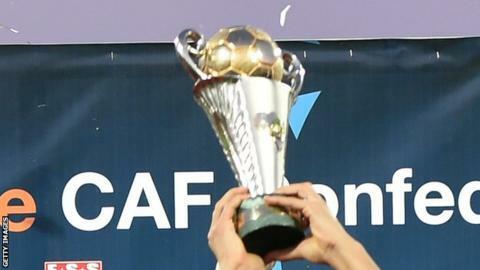 Only Al Ahly of Egypt and TP Mazembe of the Democratic Republic of Congo have won more African titles than Zamalek, but the Cairo outfit have not lifted an African trophy since 2003. CS Sfaxien of Tunisia, winners of the Confederation Cup a record three times, launched their campaign with a convincing 4-1 home win over Green Buffaloes of Zambia. Army team Buffaloes came from behind to be level at 1-1 by half-time, but late goals from Hani Amamou and Firas Chaouat left Sfaxien well placed to win the tie. Etoile du Sahel, the other Tunisian challengers, have won the competition twice and a 3-0 home win over Stade Abidjan of Ivory Coast virtually assures them of overall success. Karim Aouadhi and Maher Hannachi scored within four minutes during the opening half in Sousse and Ahmed Akaichi netted soon after half-time. In the pick of the other results on Saturday, a couple of late goals from Colombian Leonardo Castro gave Kaizer Chiefs of South Africa a 3-0 win over ASSM Elgeco Plus of Madagascar in Durban. There were two fixtures on Friday, and Raja Casablanca of Morocco begin their defence of the title at home to Cercle Mberi Sportif of Gabon on Sunday.